One the first day of September, 1715, Louis XIV died of gangrene, ending his record 72 years on the throne. This film by Albert Serra (The Story Of My Death, Birdsong) gives the audience an intimate, meticulous view of the Sun King's final days, as courtiers and physicians fuss over his frail body and the ailing monarch attempts to maintain both dignity and regality. Jean-Pierre Léaud (The 400 Blows, Irma Vep) is quietly compelling as the dying king. His Louis spends almost the entire running time prostrate on a variety of recliners and ultimately his death bed. 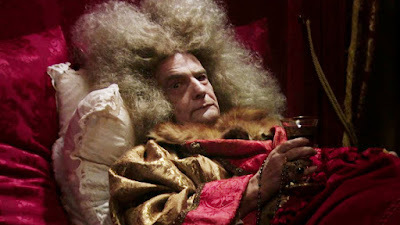 Propped up for visitors and stuffed into a succession of ludicrous periwigs that range from “sad candyfloss” to “Full Phil Spector” the king seems for much of the film to want little else than to sleep and be left alone with his beloved hunting dogs. The court, however, has other plans and Louis must still perform as a gracious king for crowds of simpering courtiers desperate for royal acknowledgement and listen to interminable appeals for money from those who would maintain and expand his empire. For the most part, Serra confines the action - such as it is - to the Royal chambers, with Louis being occasionally wheeled out to perform duties of state before returning to his sanctuary. Sets are claustrophobic and lit by soft candlelight. Clever sound design fills out our sense of time and place though the crackling of a hearth, the soft murmur and tittering of courtiers and the ragged panting of the Royal hounds. With so much of the film focused on Louis’s prone form, it is left to Léaud to hold our interest. His portrayal of the dying king flits from a resigned sadness to calm, almost amused perseverance and allows us to see the occasional flash of Royal temper, such as his gasping for water in the night, only to reject the proffered cup in favour of a crystal glass. WIth a voice like parchment and a ghastly pallor, the king is a physical wreck but Léaud manages to exude a measure of dignity and steel despite his increasingly pathetic circumstances. In the end though, this is a film not simply about a man, but about the apparatus of state, as those surrounding the King attempt to keep him alive while not committing an error that could doom their own careers or even lives. A parade of quack physicians squabble over the diagnosis and treatment for what initially seems like a mere pain in the leg. The King’s body is bled, prodded and probed and his pupils compared to an array of glass eyes, each suggesting a different and equally useless prescription. “Donkey milk,” pronounces the doctor, having finally found a match for Léaud’s dimmed iris. At just under 2 hours and often painfully slow, The Death of Louis XIV can test the patience at times but Léaud’s performance remains compelling and Serra has a sharp eye for details both period and emotional.